YourBlock goes to market to provide a solution to GDPR and protect both consumers and service providers through Blockchain technology. The YourBlock platform will completely change how consumers perceive data. We understand some people are unaware they are sharing personal information, and we hope to educate individuals that their data is invaluable. As much as supporting the consumer, our platform will help Service Providers too. On 15th November, YourBlock, one of the first Blockchain comparison and incentivised Personal Data storage platforms, will launch its token pre-sale to raise $30 million to develop, test and go live with ‘Dave & You’ in the summer of 2018. In an age of serious hacking risks and nuisance marketing cold calls, the YourBlock online digital filing cabinet will give the consumer much needed peace of mind and assurance by putting personal data back into the control of the individual. And with the General Data Protection Regulation (GDPR) coming into force in May 2018, the YourBlock platform will provide a solution to allow for compliance to Service Providers, avoiding possible fines of up to of €20 million or up to 4% of global revenue. While consumers will input and manage their own data, Service Providers will upload details of plans and offers, with YourBlock operating as a two-sided piece of technology, connecting both parties with transparency and trust through Blockchain technology. By participating within the platform, there will be a fundamental change in relationship with the consumer, empowering them to shop for insurance and utilities by being in control of their data and rewarded for doing so. This new ‘privacy bank’ will also close the gap on the collection of personally identifiable information (PII), which has been a serious issue with information phished on the internet, leading at times to identity theft. Zero personal data will be sold to third parties, minimising unwanted third party marketing calls, e-mails and SMS. With Service Providers inputting information, consumers will be able to directly renew, modify or cancel plans and receive tailored quotes specific to their needs, cutting out the middle man (price comparison websites). YourBlock will “anchor” to the public Ethereum Blockchain to prove and achieve immutability and data integrity, without making the data itself publicly visible. Currently, many legacy systems in place are built on old technology, making it difficult for the consumer to cancel or even question the service provided. YourBlock fully intends to be at the forefront of a digital revolution by creating a secure, safe and private platform. Participants of the YourBlock token sale will be able to use YourBlock tokens, YBK, to make purchases of insurance and utility products and for discounts on the services available. The YourBlock token sale provides a means to scale out a beta pilot to launch the end user product ‘Dave & You’ in Q3 2018, with a message of championing consumer protection and opportunities for service providers to minimise on costs and time. Dave & You aims to disrupt consumer-based service industries, starting with insurance and utility services and will attempt to quickly establish itself in the UK. Plans are in place to launch Dave & You in Europe, North America, Asia, Australia and South Africa. The YourBlock token pre-sale starts from 15th November and ends 12th December 2017. Main sale runs from 13th December 2017 to 31st January 2018. This document and any other documents published in association with this press release relate to a potential token offering to persons (contributors) in respect of the intended development and use of the network by various participants. This document does not constitute an offer of securities or a promotion, invitation or solicitation for investment purposes. The terms of the contribution are not intended to be a financial services offering document or a prospectus. The token offering involves and relates to the development and use of experimental software and technologies that may not come to fruition or achieve the objectives specified in this white paper. The purchase of tokens represents a high risk to any contributors. Tokens do not represent equity, shares, units, royalties or rights to capital, profit or income in the network or software or in the entity that issues tokens or any other company or intellectual property associated with the network or any other public or private enterprise, corporation, foundation or other entity in any jurisdiction. The token is not therefore intended to represent a security interest. For further information, request for interviews or images, please contact Sonal Patel. 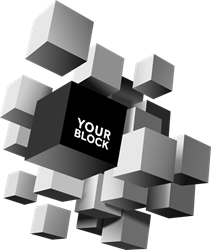 YourBlock is a private ecosystem, anchored to the traditional Ethereum Blockchain, using smart-contracts to allow for the secure storage of personal data. Smart-contracts and the nature of the Blockchain technology will also allow Service Providers to upload information of available services. Both parties will meet on the ecosystem, to manage their policies (the consumer) or to provide quotes (the service provider). Dave & You will be the front facing product for consumers to access when the platform goes live. Artificial intelligence enabled Chatbot, ‘Dave’, will always be available throughout, to support users on the platform. Through the technological architect and algorithms of YourBlock, the more ‘Dave’ learns, the more he will help users. The more the consumer engages with the system, the more 'Dave' can help find the best and relevant plans, and send renewal reminders. The more participants of Dave & You, the better ratings of the Service Providers, helping not only the users to make a more informed choice of a service or product, but give valuable feed back to the Service Providers, to improve their offer. 30% of YBK tokens sold to public in the token sale. Behind YourBlock and the vision of Dave & You sits a family of three; Daniel, Ben and David Antcliff. Between them they hold an average 25 years’ experience in finance, insurance, data and system development within profitable businesses. Those businesses have turnovers in excess of £100 million per annum, operating globally, with data managed from multiple territories. YourBlock is working with smart software development service, Gigster, to create a team comprised of the best software developers and product managers in the industry. With YourBlock developing its own private blockchain to protect consumers, the team takes the safeguarding of all participants seriously. Security is one of YourBlock’s core principles, and the team has taken several steps to provide the best possible governance of the token sale and protection of the platform technology. To ensure the token sale is structured and secure and to minimise breaches, YourBlock is working with professional and experienced consultants in the token sale industry, who apply best practice, as well as robust and thorough legal advice. All steps have been taken to protect the participant, through implementing independent audits, validation of the YourBlock proposition and a secure wallet controlled and protected by an independent qualified entity. An independent auditor has been recruited to ensure protection over the participant’s funds are not jeopardised. In the event of a security breach, YourBlock, will inform participants of such and provide clear instructions.